Most total hip arthroplasty patients in the US undergo a cementless procedure. So, the issue for their surgeons isn’t which type of fixation – cemented or cementless – but rather which type of stem they’re going to use. In most cases, the answer will be a proximally porous coated stem, Wayne G. Paprosky, MD, said at the recent ICJR East ISK Hip & Knee Course. Dr. Paprosky, from Rush University Medical Center in Chicago, Illinois, noted that development of this type of stem has grown significantly over the past 10 years compared with development of fully porous coated stems. One of the issues with fully porous coated stems is their association with stress shielding in the proximal femur, which can lead to bone resorption. This may not be clinically relevant, Dr. Paprosky said, but it can cause challenging revision surgeries – which is why surgeons have moved away from fully porous coated stems in most situations. Early iterations of porous coated stems had their issues too: They were manufactured from cobalt chromium, which left many patients with thigh pain due to the stiffness of the stem material. The newer titanium alloys used in most current porous coated stems allow for distribution of mechanical stress more efficiently through the proximal femur. Dr. Paprosky said that in general, patients with a Dorr type A or type B femur can receive a single-wedge, a double-wedge, or a tapered round stem. Patients with a Dorr type C femur do better with an extensively coated stem or cemented stem. Modular stems or Wagner cones are appropriate for patients with dysplastic hips, he said. 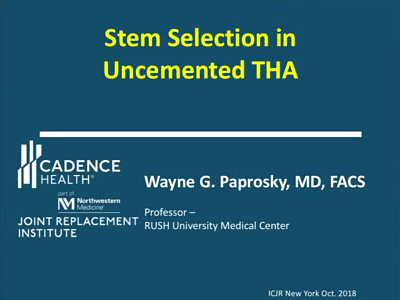 Click the image above to hear more from Dr. Paprosky about stem selection for primary THA. Dr. Paprosky has disclosed that he receives royalties from and is a consultant for Zimmer Biomet and Stryker and that he is a consultant for Medtronic-Salient and Intellijoint Surgery.